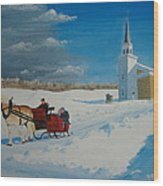 Queen duvet cover (88" x 88") featuring the image "Going Home From Church" by Norm Starks. Our soft microfiber duvet covers are hand sewn and include a hidden zipper for easy washing and assembly. Your selected image is printed on the top surface with a soft white surface underneath. All duvet covers are machine washable with cold water and a mild detergent. Thank you, John, for the feature. Thank you very kindly, Malanda. Thank you so very much, Jim. CONGRATULATIONS, Norm! This artwork has been chosen as an Administrator's Pick and showcased on the homepage of the �Midwest America Artists� group, 1/22/2017! You�re invited to archive this by posting it in our Discussion thread, �Archive Your Art, Featured Or Picked For Our Homepage.� L & F! This is so beautifully created! Brought such a smile to my face, :) L/! Thank you so much, Angela...especially for the smile! Congratulations your work is featured in the FAA Group In GOD We Trust!! Thank you very kindly, Debra! Thank you so much for your votes and faves, Nava. You are great! Thanks for the f/v, Lee. Thank you, Rick, for your insightful comment, vote and fave! I appreciate you! Beautifully done. Creates a festive and happy mood. Thanks for your visit and comment, Lee. Thank you very much, Glenn! Thank you so much, Daliana. I appreciate your comment as well as your extraordinary portfolio as well! Greetings from the USA! With another snowstorm fast approaching, this couple hopes to make it home from church before the storm hits. 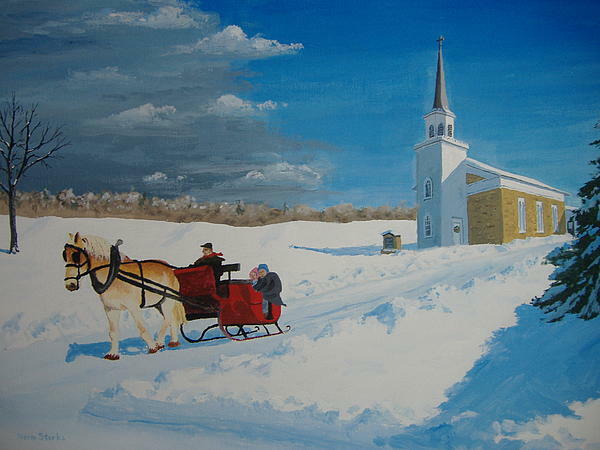 Hopefully, this painting evokes nostalgic memories for you. 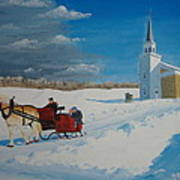 I used the Shopiere Congregational Church in Shopiere, WI, as my model for the church. It was built in 1844 out of native limestone. 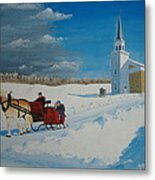 The original is painted on a 16" x 20" stretched canvas with sides painted so there is no need for a frame. Please contact me to purchase the original, or order a print or card right here!